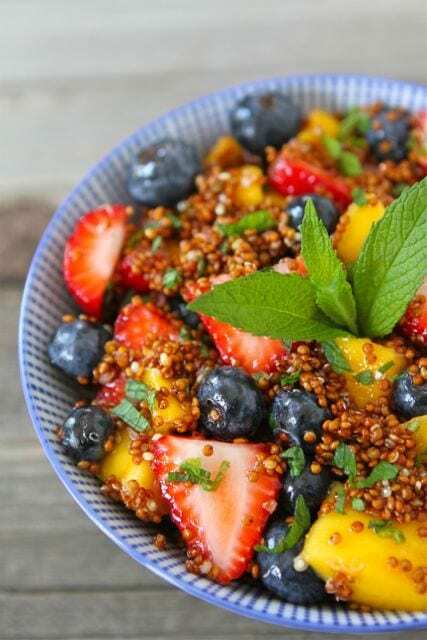 For this particular Quinoa Fruit Salad, I used blueberries, strawberries, and mango. Feel free to use whatever fruit you like-peaches, blackberries, raspberries, kiwi, and pineapple are great options. I like to mix it up with whatever fruit I have in the fridge. I also used red quinoa, but any variety of quinoa will work. 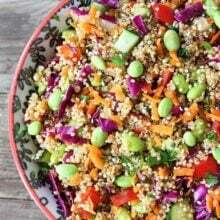 I just like the pop of color the red quinoa adds to the salad. 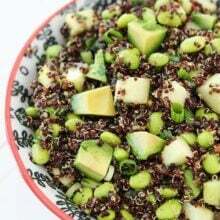 The Honey Lime Dressing is easy to whisk together and is the perfect ending to the colorful Quinoa Fruit Salad. I also added in a touch of fresh mint because our backyard is being taken over by mint…and it adds a refreshing kick. 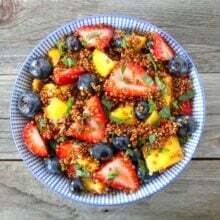 Make sure you check out our Berry Quinoa Salad too! I love the berries you used…and the dressing…anyone could and should be able to get into quinoa like this! Where do you find the red quinoa? I was introduced to the red quinoa a couple months ago and have been unable to find it in my stores. I buy red quinoa at Whole Foods or Winnco. I hope you can find it! looks so fresh and vibrant! Do you grow your own fruits/herbs/vegetables? We grow our own herbs and we have a plum tree, but that’s it. so fresh and vibrant! do you grow your own fruit and veg? Original, beautiful, fresh, delicious and healthy! This salad is perfect. This does sound like such a great summer lunch! This looks fantastic and refreshing! This is so pretty! Perfect for summer – I love it! Love this! Seriously, love everything about this. I really like that you used red quinoa, it is so pretty! Yum! That looks like something you can eat for any meal of the day and even as dessert. I’m one of those people who just really doesn’t love quinoa, no matter how much I try to because of its health benefits. This, though, looks absolutely delicious and perfect for hot summer days. The dressing sounds amazing! I’ve made a version of this with a creamy yogurt dressing. I’m going to try yours for a dinner. I LOVE fruit. Thanks for sharing! It’s so hot here in Arkansas…fruit is the perfect dessert. Love the combo and LOVE that dressing!! Yum! I can see a big bowl of this salad for breakfast!! Such a beautiful salad, Maria! You just made my foodie heart pitter patter! Beautiful. So pretty! I love this use for summer fruits! Can’t wait to enjoy it for lunch on a hot summer day! I love this, especially the red quinoa, which I haven’t seen in my neck of the woods. And I bet the mint just makes this perfect. Have a great day! I am on SUCH a quinoa kick lately. This looks great, I will definitely be trying it soon. Thanks! It’s like the best thing I’ve ever looked at. What a light, refreshing, and healthy dish Maria! I’vebeen looking for something light to make this weekend. The honey lime dressing sounds incredible. I love simple homemade recipes just like this. Can never go wrong with all that fruit, too! This is beautiful! Definitely a perfect summer salad! I’ve only had savory quinoa dishes so I’m really excited to mix it up with this fruit recipe! I only ever do quinoa with veggies. What a great idea to make it into a fruit salad. Looks gorgeous, and I am sure it makes an amazing snack! oh my gosh- so with you! I could eat fruit all day every day. The quinoa is such a fun add in. Makes it more meal like…justifying our fruit intake…I like it! ahhh this looks so refreshing. 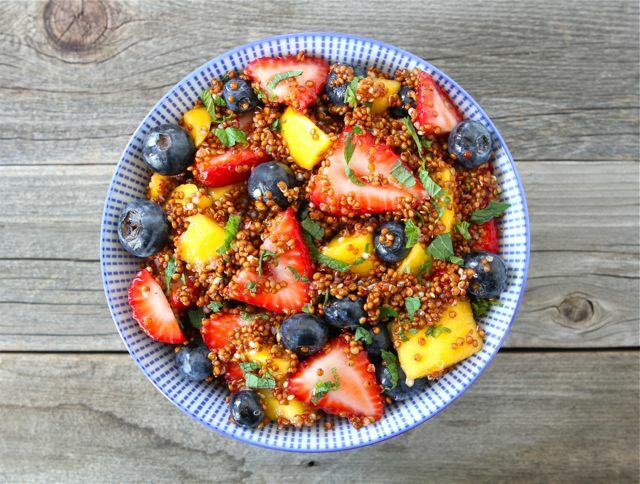 You can’t go wrong with two of the best things-quinoa + fruit! I love fuit too! Yum! Can’t wait to try this it looks so yummy and colorful. Look in the grain aisle by the pasta and rice. I buy it in the bulk bins at Whole Foods, Sunflower Market, Smith’s, and Winnco. Most stores have it. that looks of delicious! and that dressing sounds divine! Maybe I will have to stop calling you the cookie queen and start calling you the gorgeous, healthy salad queen…. I would SO eat this. Can’t wait to do just that! You have this recipe posted under your Vegan recipes, but just so you’re aware it’s not truly Vegan because of the honey. However, I was able to substitute agave nectar for the honey, and this salad turned out to be super delicious! Thanks! Thanks for catching that! Yes, agave is a great substitute! So refreshing and healthy, Maria! I’ll definitely keep this in mind this summer. I still haven’t made a sweet dish using quinoa…only savory and I would love to try using it in a fruit salad. Like you, I’m a huge fruit freak, so your salad looks perfect to me (great for the 4th of July, too!)! I just made a half batch of this and I am kicking myself for not making the whole amount. Delicious! I’ve become a fruit maniac this summer also! I don’t know what is up but I can’t stop eating it. This looks like the perfect lunch for me, then! Wow, that looks heavenly. You are inspiring me to make a fruit salad right now! I have to go out and get some quinoa before I make this exact recipe, though 🙂 But I can’t wait! Sounds so refreshing! I love the simplicity of this dressing. I haven’t loved quinoa in the past when I’ve tried it but I think this would become a favorite of mine! Love all the gorgeous colors! I am a fruit fanatic too! I graze on it throughout the day. It’s just so good during this time of year! 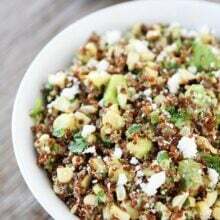 I love quinoa and this looks so good! We experimented using quinoa in a recipe last night. I’ll be posting about it in the next couple of days! We found our red quinoa (as well as white and black) at Good Earth. Beautiful photos! So fresh, so healthy and so YUMMY! Fruit in summer is so perfect. Love the color contrast in this, the dressing sounds so good too! what a great way to get your protein and your fruit! Yum! I have a ton of pineapple to use, so I think I’ll throw some of that in too! I made this last night used peaches, blueberries,blackberries, raspberries & red grapes – served it wih grilled rosemary garlic shrimp. It was fanastic. I just finished The Digest Diet and this recipe fits perfectly with their meal plans. Thank you! This looks so light and refreshing! Perfect lunch for days like today when it’s 100+ degrees out there! This looks so yummy! I made something similar with some left-over couscous for lunch yesterday, but I used a lemon basil dressing. I like the idea of honey lime! Yum! I want this for breakfast! Why not, right?! Maria, this is stunning. So fresh and healthy, the perfect summer dish! Pingback: Summertime…and the livin’ is easy « Kitchen Alchemy…. when I start eating quinoa again [let’s hope post pregnancy], I’ll be making this for sure! totally going to make this for the 4th. LOVE this idea! I finally made this salad. I love, love, love it! I used a red, black and r”white quinoa combo fromWhole Foods. Very tasty! Thank you for yet another great, healthy recipe! What a great healthy dish. So much color and nutrients! Now this is my kind of salad…..and now you made me crave some whole grains. yum! Found this today on pinterest… came home not even 2 hours later and now am devouring a bowl of it with fresh picked blueberries, perfectly ripe peaches, and huge raspberries! Yum! I didn’t have any mint and used up all the honey I had on hand, but I will be making this again (soon)! Thanks for a keeper recipe! I made this today and it is sooooo good! Although, in the future I’ll need to double this because we’re eating it so fast. Thank you! This looks like a fabulous summer-sald! Fantastic on hot days like now! Just perfection! Thank you so much Maria, wonderful for a summer day, will share it with my friends and family in my blog! 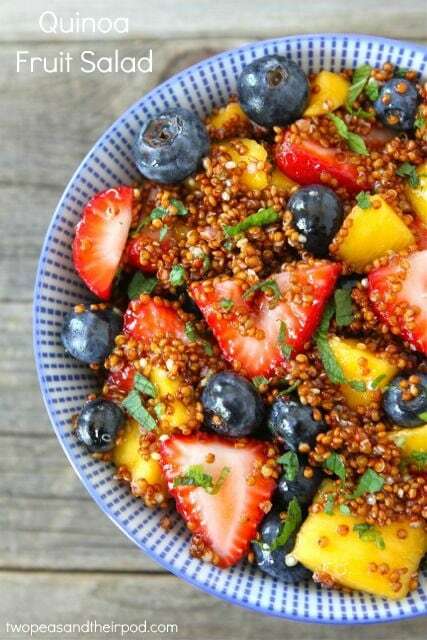 My 2 year old adores red Quinoa a fruit, so this is just spot on for today’s picnic!!!! Greetings from sunny Oslo!!! I have a quick question… Is it 1 cup cooked quinoa, or 1 cup uncooked…… It looks AMAZING! 1 cup uncooked, you cook it. Look at the recipe for instructions! I hope you enjoy! It is one of my favorite summer salads! this is random, but do you know where to get the bowl your food is in? i picked up a couple at TJMaxx a while back and don’t know the maker or where to get more! I made this last week, it looked so pretty and tasted great! Made this today – tastes so yummy! Love that’s healthy so I’m sticking to my diet. This was so delicious! Thank you!! What can I substitute for the honey (maple syrup, corn syrup)? This looks incredible with the bright colours. I’d never have thought to put quinoa in a fruit salad before. About how much juice should you get from one large lime? This looks great and I’m trying it today, just wondered – did you put the dressing on at the end or earlier to allow the flavours to absorb? You can make the salad in advance to let the flavors sit. It is good both ways! I just ran across this recipe and made it for a family campout. It was great because it didn’t require a ton of refrigeration like potato salad would. Everyone tried it and although I only heard a few raves, the large bowl was mostly gone. I increased the amoutn of dressing because it didn’t seem like much but today’s leftovers are VERY lime-y. Even the kids tried it because of all the fruit! I made this yesterday. Added a big handful of shredded coconut and toasted sliced almonds. Delish!! I’m not a big fan of Quinoa. but I do eat it. I LOVED this dish. You couldn’t taste the Quinoa, yet it had the protein to fill me up. YUMMY!!! I used white Quinoa. This will be a recipe I keep. Thank you! Do you have any idea how many calories are in this salad? 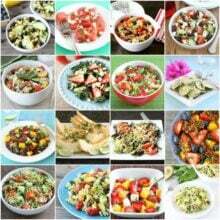 Pingback: 18 Delicious Breakfast Salads | The Usual Sources – Where You Are The Source. HAS ANYONE TRIED USUSING RICE COOKER TO COOK THE QUINOA AND IF SO WHAT WERE THE RESULTS? Made this with cantaloupe instead of mango (husband doesn’t like mango 🙁 _) and it was fantastic! Best fruit salad I’ve ever had. It is best the day it is made, but I’ve eaten leftovers the next day and it is still fine. This looks delicious! Do you think I could substitute frozen fruit and get a somewhat similar effect without it turning into a big goopy mess? (Assuming I thaw my frozen fruit at room temp, and not in the microwave). Fresh fruit is best but if you have frozen fruit it will still work if you defrost it. Enjoy! To really take this recipe over the top, add goat cheese! It really tied everything together perfectly. I served this for people at brunch and it was a huge hit! I hate that I clicked on a link on fb for a story about Chrissy Metz and ended up here. At least be honest in your advertising. This type of garbage infuriates me. That ad is not from us. Someone showed it to me and I have no idea how that got on Facebook. We would never put an ad like that up and I have no idea why they linked to our site and this recipe. It doesn’t make sense. Sorry! This is our family’s favorite fruit salad. The mango really adds great flavor. This sounds so lovely for a Spring brunch I am planning! Do you think it would be good on a bed of baby spinach? Quinoa is a very healthy and tasty option for breakfast. It is low in calories and promotes weight loss. The high protein content in it keeps you full for a longer time thus reducing overeating. I loved it! I’m on an anti-inflammatory diet, and this recipe fits right in. I substituted oranges for the mango. Yum! Are you interested in Quality Wrist Wraps Support @ 0.99 USD. If Yes Then reply us with your Logo and Country Name. you will reply this email.